"This is the way we do when we're fixing to go to cutting," Elva Hough explains sharpening his cradle. 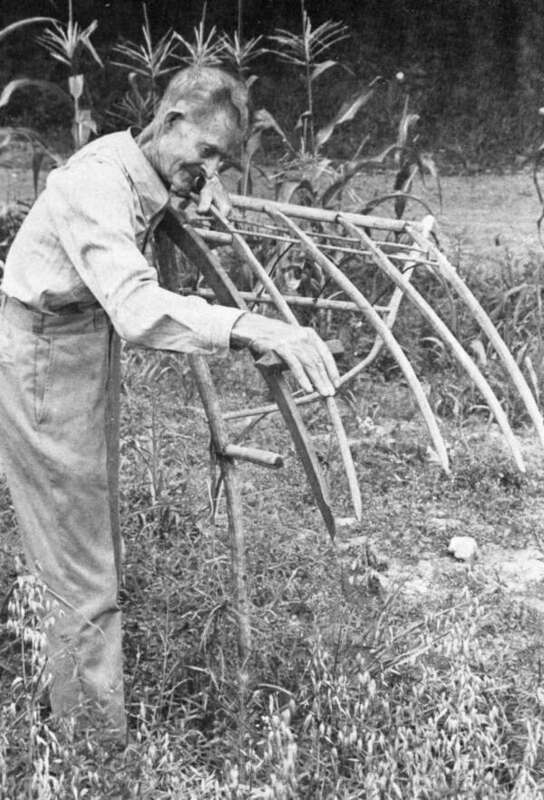 Until the early 1900's when the horse drawn binder became widely used on the Ozarks river bottom farms and larger fields, the hand-powered grain cradle was an important agricultural tool used in harvesting grain crops for later threshing or feeding. 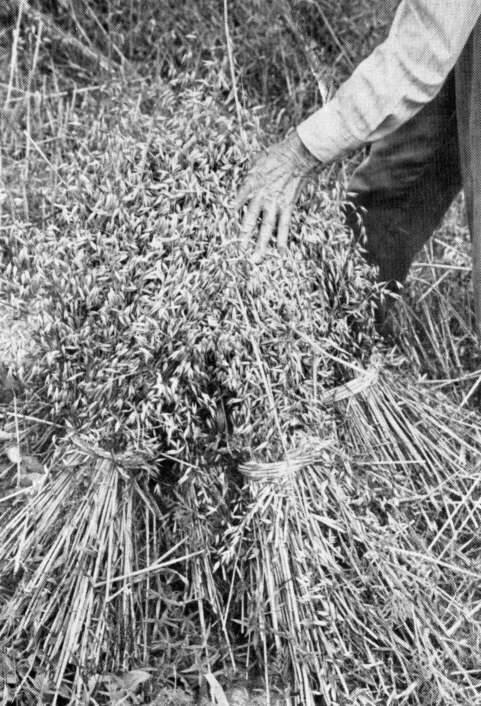 Many Ozark farmers like Elva Hough continued well into the twentieth century to use the hand cradle to harvest grain. 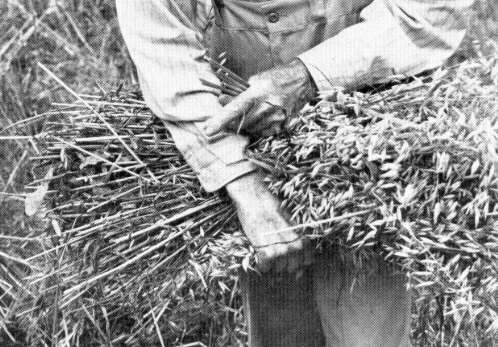 Proficient in its use, he continued to use it occasionally until 1946 when he cut his last two acres of wheat with it. He still has the stronger of the two cradles his father and he bought back in 1901. 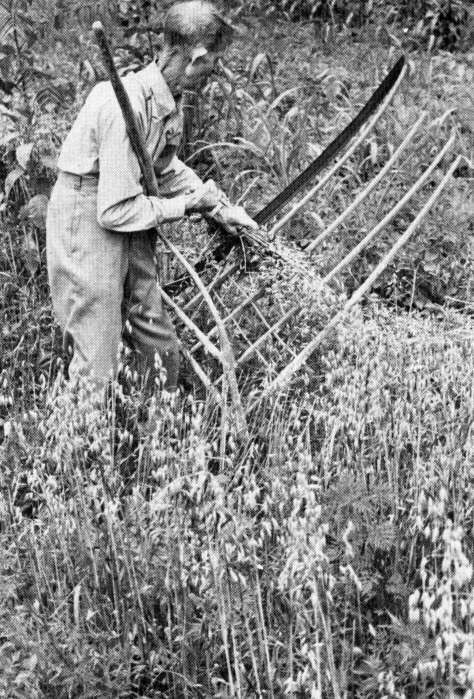 To show us how it was used, Elvie planted a small patch of oats, got the old cradle out of storage, sharpened the blade and on a hot July morning strode down the patch swinging the cradle, catching the grain and throwing it in piles behind him so quickly we had to slow him down to understand what he was doing. The cradle is a long-handled scythe with a built-on cradle consisting of four tapered fingers to catch the grain, and a thumb, the blade. Elvie's cradle was factory made and cost about five dollars. The cradle Elvie still has is called a "grapevine." The other cradle his father bought, a "turkey wing," was practically the same except that it was lighter weight. Both did the work, but if the wheat was heavy, the heavier grapevine was better to use. The cradle did not take much maintenance. Elvie has had his for over seventy years, and as he said, "That one there has been pretty rough treated just cutting patches of feed for cattle or hogs or whatever I was feeding." After cradling for about a quarter of a mile, it may need sharpening depending on the heaviness of the grain, and its ripeness. Every cradler carried a whet rock in his pocket to sharpen the blade as needed." 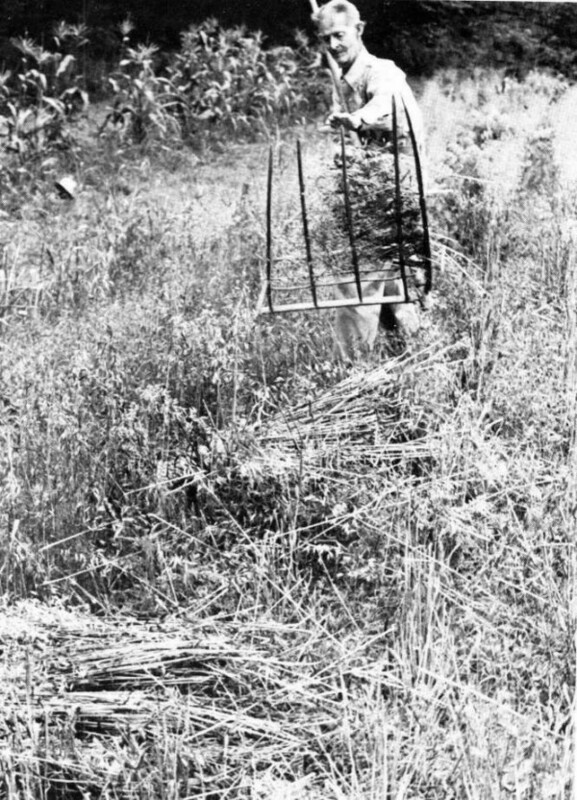 Harvesting procedure using the cradle was done several ways depending on the size of the field and available cash for labor. 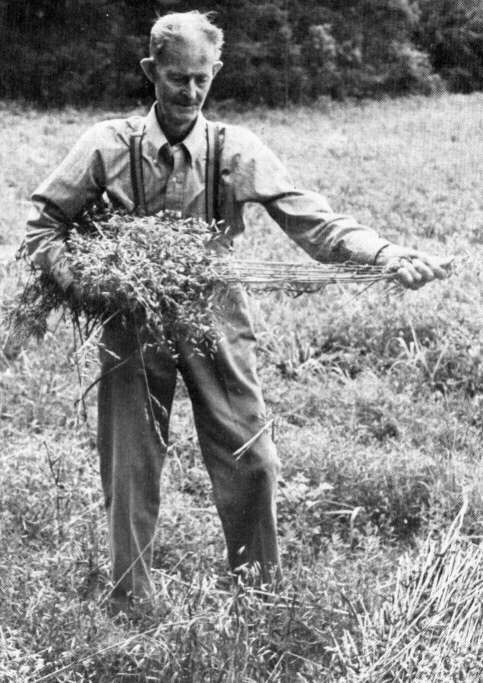 Elvie explained that sometimes, especially on small fields, families would cradle their own crop. He and his cousin would cut, tie and shock their own crop. They'd cut as much as they thought they could finish, go back to tie it into bundles, then shock it. Elvie said, "What it'd about average was four acres a day for two of us, and that's a pretty good day's work." If the fields were bigger, requiring more help, most small farmers traded work rather than paying wages. Usually eight to ten neighbors, or as many as it took to complete the job, would come to a farm, harvest the crop there, then move to the next. By working for everyone else, each got his crop harvested. 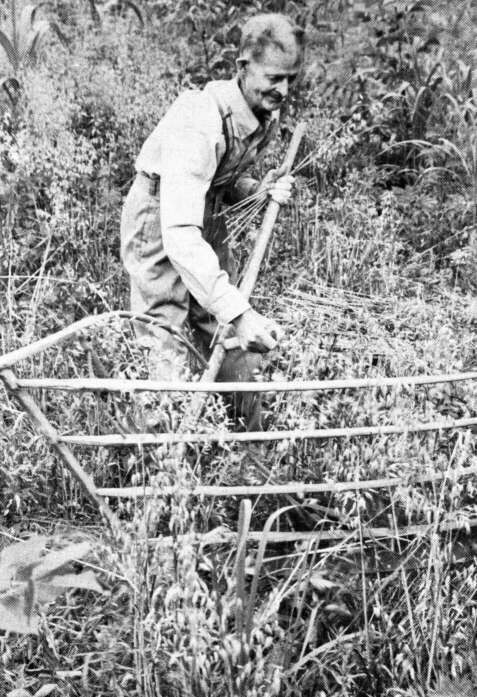 Farmers who had especially large fields, usually those on the river bottoms, had to hire harvest crews. Elvie remembered, "I drawed a dollar and a quarter a day for cradling. It was seventy-five cents for them that tied and seventy-five cents for the ones that shocked." With a crew harvesting, about five or six men with cradles would begin, one following the other. The lead would lay off the land, usually the length of the field and as wide as they could finish in a day. The cradlers would cross the field swinging, catching the grain and dropping it on the ground, one strung out behind the other, circling the field in smaller circles each time around. Behind them would come a couple binders or "tie-ers" who would pick up the piles of grain, tie them and throw them in windrows for the shocker. Last of all would come the shockers who picked up the tied bundles to put in shocks. 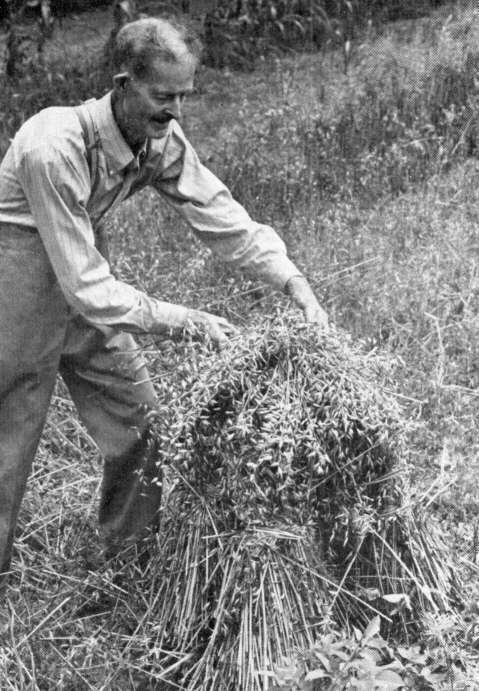 Sometimes, instead of being shocked, the bundles were hauled to be stored in huge stacks near the barn for easy feeding or later threshing. Cradling looks easy watching an expert like Elvie move easily down the field, but it takes practice, skill and stamina, holding the cradle with the right hand on the short lower handle and the left hand near the top of the long handle, the cradler walks down the center of the swath he intends to cut, usually seven feet wide. He swings the cradle from right to left, turning his body halfway around with the swing. 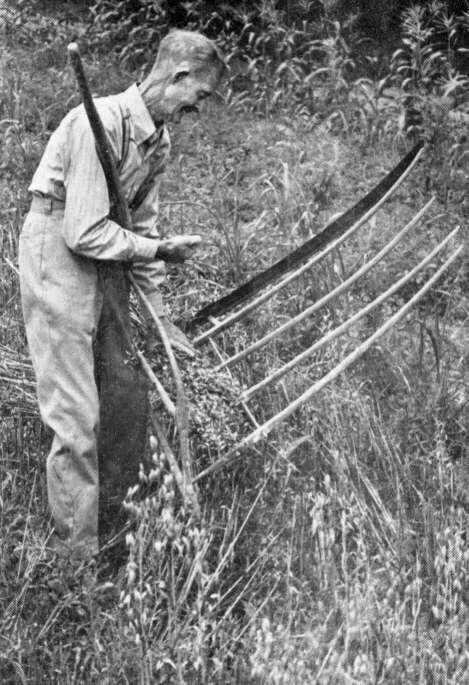 The sharp blade cuts the grain about four inches from the ground to keep out of the weeds. The grain falls on to the fingers with the heads away from the blade. "They always cradled with their blades coming out of the grain. The fingers of the cradle catch the grain, the heads all the same. "Now let me pull this out." "Wrap it around the bundle like this." The grain falls into a neat bundle held in place by curved rods. Grasping the grain in his left hand, he throws it behind him onto the cut stubble. "We'd tie them bundles and throw over that-a-way. "Catch between your finger and thumb, you see here. Then twist it. Go on around and push it under. At the completion of the swing the grain falls toward the handle, the heads all the same way. 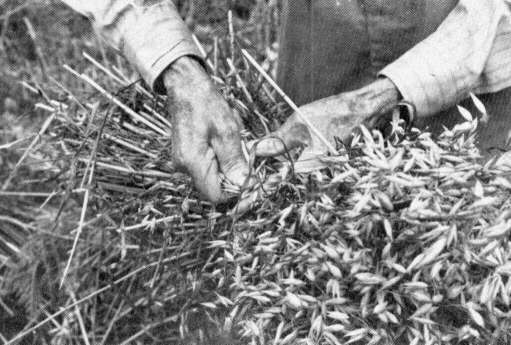 Elvie supports the cradle with his right arm and left leg while he grasps with his left hand the bundle of grain that has been held in place by the curved rods built in the cradle, his body turned partly around following the swing of the cradle, he drops the grain on the stubble that he has just cut. He grabs the short handle again with his right hand, the long handle with his left, swivels his body forward again, takes a step and makes another cut. Swing, grab the grain, drop it, step, swing, over and over in rhythm without pausing for the length of a field. Elvie says, "I'd go a quarter of a mile, then stop and rest, whet the cradle, it wouldn't take but a few strops, then turn around then and be ready to go again." To tie a bundle Elvie holds the grain under his right arm. He then pulls a few stalks of grain out, and wraps them around the bundle. He catches the stalk ends between his finger and thumb twisting them around and pushing the ends under to form the knot. "We generally, when we set them down, put two this way, and two over there. We leave six to eight standing." "You put one across then we'll turn another across like that. You see, you got a double cap there. And it won't rain in to it. The wind don't blow them off and tear it up, why it's there." 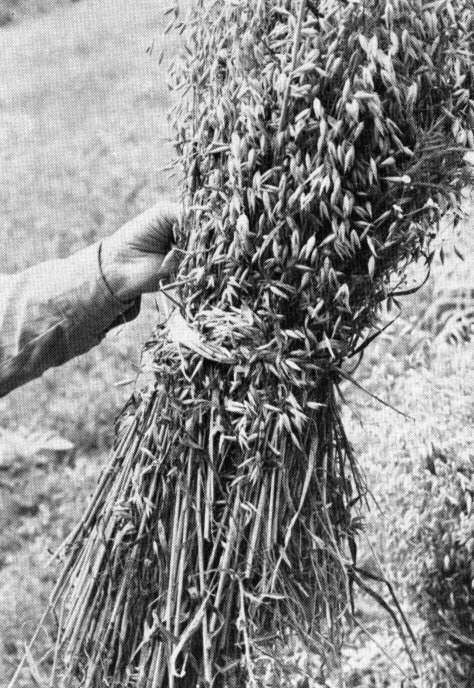 To shock the grain he sets the tied bundles upright against each other with the grain end up. He starts with two bundles leaning together to form the nucleus. Other bundles are added around these, two at a time opposite each other to balance the shock. Depending on the grain, how long it is, and its weight, he sets six to eight upright. If the bundles are small, he would use eight or even ten to a shock. The bundles would have to stay usually a few weeks to cure and wait for the threshing machine, so the shock would need to be capped to keep the grain dry. 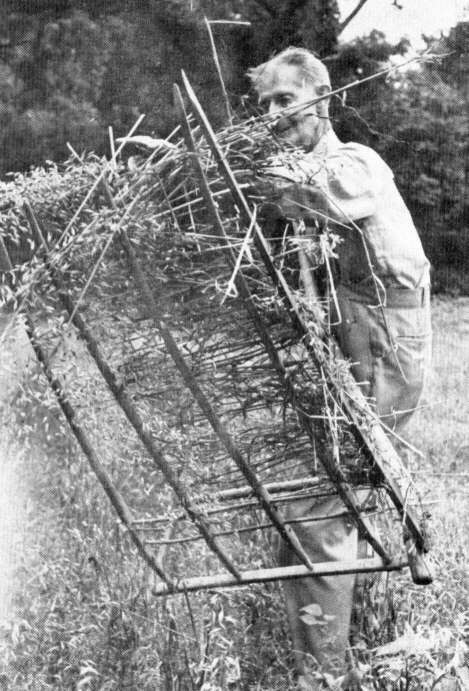 He spreads out one bundle as much as possible without untying and lays it one way across the tops of the upright bundles. This makes an effective "roof" to shed the water. "You put another bundle on top of that and it'll stay there until September or October. I've seen them haul them out way up in October. But they're better the quicker you can thrash them after they get cured. You see, you got a double cap there, and it won't rain in to it. The wind don't blow them off and tear it up, why it's there." He is right. When we went back to make molasses in October, the shock he made for us was still standing and the grain was dry. "So I'd go clean down the length of the field and turn around and come back the other side."